Rent the space for half a day for 4 hours. $75: 4 hours and any additional hour is $25/hr. 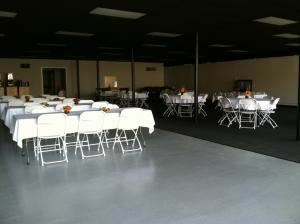 Rent the space all day for your wedding or event! $100 deposit required. Support local! We are one of Tyler's premier hotel and convention facilities that elegantly accommodates 5-450 guests with up to 9,000 square feet of flexible space. We would love to host your Wedding, Conference, Reunion, Party, Business Meeting, Club. you name it! Our amenities: Magnuson Grand Hotel and Conference Center in Tyler, TX has up to 9,000 square feet of flexible meeting space, bar & lounge, access to caterers, veranda, seasonal pool, beautiful grounds, and rooms for overnight travel - all at an affordable rate! We have 104 newly renovated rooms for your guests, with complimentary hot breakfast included. Elegant, Courteous, Affordable. Experience our elegant atmosphere as you enjoy your special day. The beautiful grounds of Bella Sera Ranch provide the unique environment for your wedding day, whether you choose to say I Do in our historic style Chapel or the Outdoor Pavilion, we are here to make your day as enchanting as you have imagined.